His college wrestling career behind him, John Wise was left with one of those life decisions: Should he pursue employment bouncing off turnbuckles or banging helmets in football's trenches? "Once I finished up wrestling, there's not much of an opportunity," Wise said. "There's not, like, professional wresting. I guess there is, but it's the (WWE). "I always enjoyed playing football in high school. I enjoyed playing my freshman year in college. I was like, hey, give it a shot." The New England Patriots - who dug up guard Stephen Neal - are giving the 2009 wrestling All-America that shot. 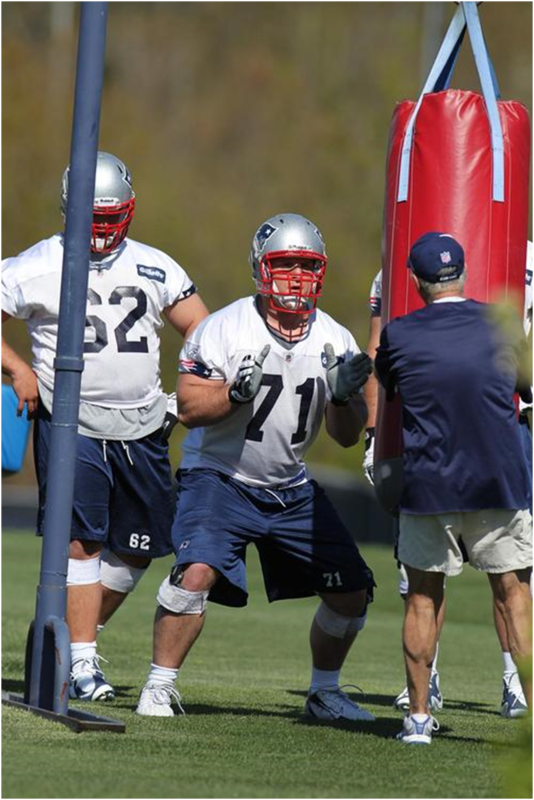 Yesterday, the 6-5, 298-pound wrestling heavyweight-turned-offensive lineman went through his second straight day of double sessions as an undrafted free agent at the Patriots rookie minicamp. "Right now, I'm just coming out on the field trying to put my best foot forward every day," Wise said. "Just trying to give my best every time I come out here." He began his college athletic career as a defensive lineman at Western Illinois, registering 16 tackles and one forced fumble in nine games in 2004 before transferring to Illinois to wrestle. At Western Illinois, Wise qualified for wrestling's NCAA Championships three times, finishing seventh at the national tournament last year. Now, though, Wise strives to follow the path of Neal, a nine-year veteran originally signed as an undrafted free agent following a championship wrestling career at Cal State-Bakersfield. Last year, the Patriots took a look at Jermail Porter, the former Kent State wrestler who is now an offensive tackle with the Kansas City Chiefs. "I think that's actually what helped me get in this program," Wise said of the Pats' past practice. "I'm giving it my shot. Neal's walked a mile in my shoes and hopefully I can do as well as he did." Just as he did with Neal, it was agent Neil Cornrich who put out feelers to NFL teams for Wise. "A lot of coaches know that wrestlers have good work ethic, but a lot of times that doesn't matter because everyone here has a great work ethic," said Wise. "It's just making those calls and getting the coaches willing enough to come down and look at you and see what you've got, and if they think you've got it they'll give you a shot." While there is a carryover effect from wrestling ("a lot of skills translate - foot work, hand work"), Wise admits he wished he'd never strayed from football. "I do (regret it) because obviously the transition would be a little bit easier if I didn't," said Wise, "but I chose the path I chose and I'm doing what I'm doing now."